Growing up as a level-nine competitive gymnast, Mackenzie Powlette gained some powerful traits in her 10 years of competitions, such as dedication and persistence—which she still carries with her today. As Green Apple’s Digital Marketing Specialist, Mackenzie will be working alongside Content Strategist Steve Miller to assist all clients with digital marketing solutions, including SEO, PPC, content marketing, social media, and analytics reporting. Mackenzie’s efforts will facilitate online growth for Green Apple’s clients. A native of Bellbrook, Ohio (which is a suburb of Dayton), Mackenzie attended Miami University, where she graduated in 3 years with an honors degree in marketing. “I was inspired by the faculty and have a genuine passion for marketing, so I truly enjoyed my undergraduate experience,” says Mackenzie. Miami University is known for its undergraduate teaching and being the “public ivy” school. Outside of her studies, Mackenzie was highly-involved on campus—from the rowing club to Women in Business to Phi Mu. “I made some great friends and learned a ton about collaboration and marketing strategy. I believe Miami University truly fostered growth for me in multiple areas,” she adds. Upon graduation, Mackenzie accepted a full-time offer from a previous internship in Chattanooga, Tennessee. While she never felt led to move away from home, Chattanooga was definitely out of Mackenzie’s comfort zone and allowed her to challenge herself. Her first job out of school was for a Textron business unit (later acquired by Emerson), doing marketing for three utility brands. “The company-manufactured capital equipment to string distribution and transmission lines. I learned so much about utility companies, linemen, and B2B marketing, as I worked with a small team that felt like a startup with corporate backing,” explains Mackenzie. This proved very useful for creative projects, and Mackenzie was also fortunate to have several great mentors while serving in this role. When Mackenzie decided to further her education and gain additional strategic skills, she was soon admitted into Vanderbilt’s business school—Owen Graduate School of Management. The school’s one-year Master of Marketing program is the MBA marketing concentration condensed into 10 months, which was a perfect fit for Mackenzie. 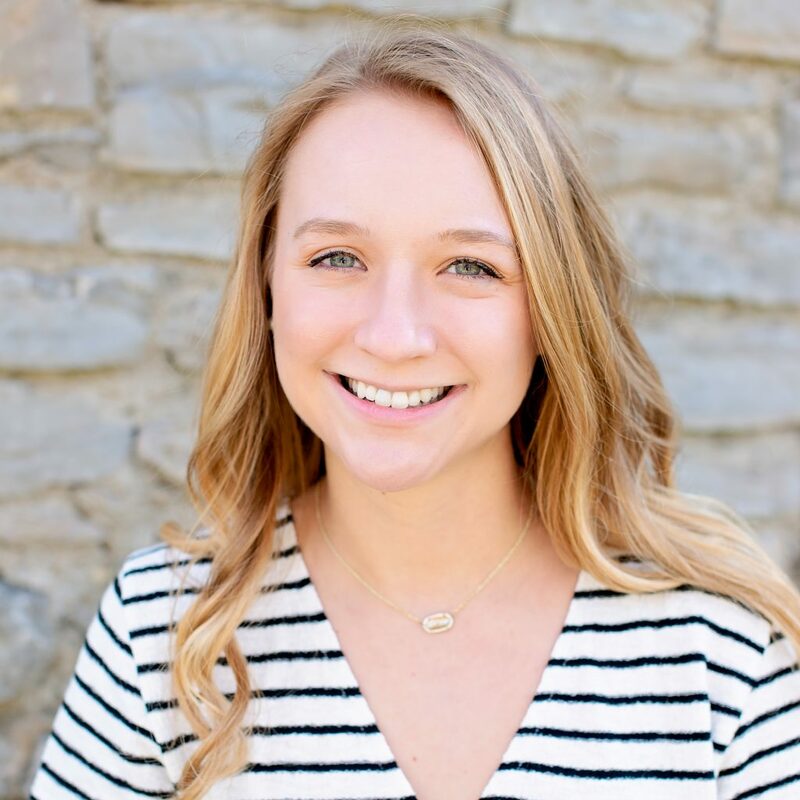 “The quick program provided a lot of opportunities for me to gain more marketing skills and explore Nashville’s thriving business community,” affirms Mackenzie. When it came to job searching, she utilized her existing network to reach out to Green Apple’s Olivia Cooper, an alumna of Vanderbilt’s Master of Marketing program. Learning about Olivia’s experience at Green Apple prompted Mackenzie to explore opportunities to be a part of the team. “I was drawn to the quaint office and location in Franklin and was also intrigued by the opportunity of an open digital marketing role. I was also excited about the opportunity to work with a variety of clients, as opposed to my corporate background in the manufacturing space,” says Mackenzie, who also loves dogs and that she gets to work in an office atmosphere with Green Apple’s Jack and Charlie. Mackenzie looks forward to bringing her educational knowledge to the digital marketing efforts at Green Apple. “I’m good at seeing the big picture and putting together digital marketing campaigns,” she says. We’re also looking forward to having Mackenzie’s talents on the team to help small businesses grow. Beyond the office, Mackenzie is passionate about being active. She loves yoga classes at CorePower Yoga, training for half marathons, and she just completed her third half marathon in Charleston with her boyfriend, Blake. Mackenzie likes to spend summers outside hiking or near bodies of water. She also enjoys going to concerts in small music venues and shopping in boutiques, and she loves “dragging” Blake around shopping on the weekends, running, and trying new restaurants. “I love how active and nice Nashville is. There are always events or festivals to go to, and music is everywhere,” affirms Mackenzie. Her favorite Nashville restaurants are Five Points Pizza and Char, and she takes every opportunity she can to spend time with her family and dog Beemer back in Ohio.